Despite their clear commitment to the hardware version of the Kindle, Amazon continues to make the Kindle apps that run on the iPad and iPhone better. Today, version 2.2 of the app brings a full dictionary with it. This matches the functionality of Apple’s own iBooks app, but the Kindle implementation is even a little better. 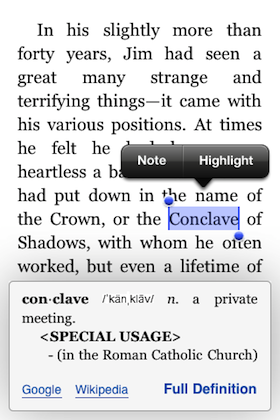 Now in the Kindle app when you highlight a word, a definition will automatically appears at the bottom of the screen. And that’s not all — there you’ll also find links to further investigate the word on Google or Wikipedia. Though this dumps you out of the app and into the iPhone/iPad web browser, it’s a pretty nice feature. The feature also includes a link for the “Full Definition” of the word. Clicking on this will take you to the new Oxford American Dictionary that is automatically downloaded with this 2.2 version of the app. This dictionary contains some 250,000 entries, Amazon says. 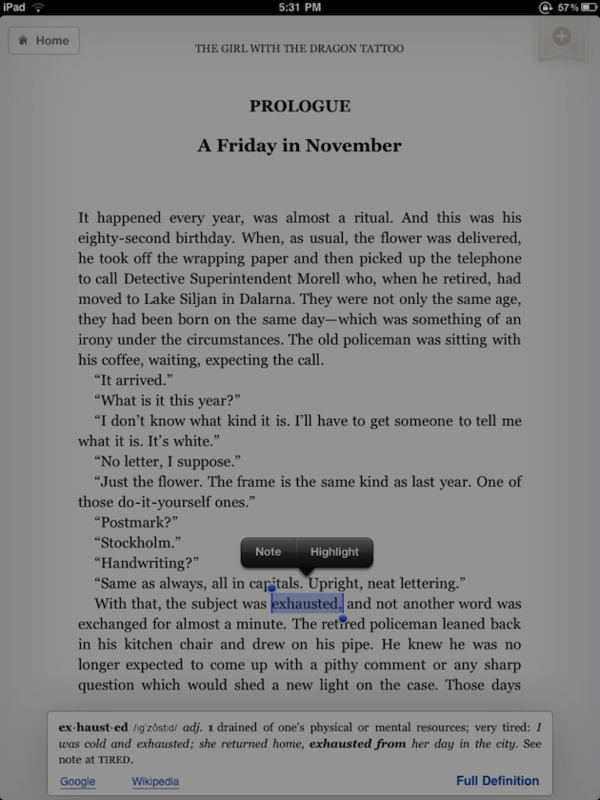 As I said, this dictionary functionality matches that of Apple’s own iBooks app. But those definitions are an extra click away (you highlight a word then select “Dictionary” which bring up the definition in a pop-up). Other small improvements include better line spacing on the iPad version, and fast-app switching for iOS 4 devices.